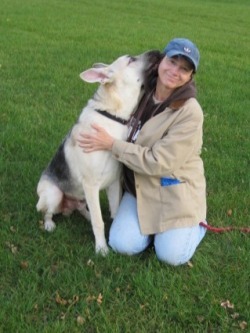 Canine Connection LLC was founded by Cindy Ludwig in 2009 to meet a need in eastern Iowa and the tri-state area for modern, state-of-the-art positive reinforcement training. 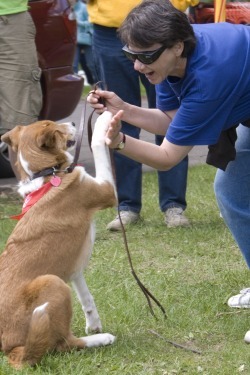 It was Canine Connection that offered the first genuine clicker training (force-free positive reinforcement training with a marker signal), taught by the area's first certified clicker trainer, and brought the idea of true force-free positive reinforcement training to Dubuque, Iowa and the tri-state area. Cindy Ludwig, an experienced professional educator, registered nurse and lifelong animal lover was the only Karen Pryor Academy Certified Training Partner in eastern Iowa and the tri-state area, and was one of three in mid-Missouri. Karen Pryor is well known among animal training professionals as one of the major proponents of force-free animal training responsible for popularizing clicker training in the early 1990's. Clicker training is not new. It was first used by the famous American psychologist, B.F. Skinner and his student, Keller Breland, in the middle of the last century. Breland and his wife Marian trained thousands of animals belonging to over 140 species for the military, television and their own IQ Zoo in Hot Springs, Arkansas. In addition to clicker training, Canine Connection set many other precedents in the tri-state area, such as being the first to offer the AKC S.T.A.R. Puppy Program, the first to offer day training, first to offer the Doggone Safe "Be A Tree" bite prevention program﻿ in eastern Iowa ﻿and the first to use pressure wraps, i.e., the original Anxiety Wrap in behavior modification. Cindy brought a unique blend of skills to dog training to eastern Iowa and the tri-state area, then to mid-Missouri with her knowledge of dog behavior and training, professional teaching experience and extensive medical background which enables her to serve dog owners with complex as well as simple behavior and training problems. With her commitment to the force-free methods taught by the Karen Pryor Academy and recommended by the American Veterinary Society of Animal Behavior and the American College of Veterinary Behaviorists, Cindy offers dog owners a unique opportunity to learn the very best ways to solve, as well as prevent behavior problems using effective, science-based training. At Canine Connection, the philosophy of positive reinforcement extends to the company's human clients as well as their animals. We offer a family-friendly learning environment and encourage the participation of children. Learning is enjoyable, individualized and immediately practical! Clients of Canine Connection are consistently awed by how quickly their pets respond to training and behavior modification. In addition to dog training and behavior modification, Canine Connection offers service and therapy dog training and testing. In 2012 Canine Connection took therapy dog testing and training to a new level by launching a new and unique therapy dog program with strict force-free requirements for both evaluators and therapy dog teams. All dog candidates must be trained using force-free methods (no shock, choke chains, leash corrections, prong collars, dominance, physical molding, verbal corrections, etc.) and evaluators must demonstrate a commitment to force-free positive reinforcement training and handling as well as a high level of expertise in dog behavior and training. Service dog fraud (KOLR10 News, Springfield, Missouri, March 2019) Interview starts at 4:51. Interview for story on LCTV regarding the recent incident in Hopkinton, Iowa and "aggressive breeds"
for German Shepherds, although I welcome all breeds into my classes and into my heart." 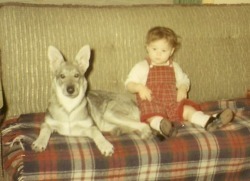 Pictured above is Cindy with her first dog, "Queenie." Undoubtedly this early relationship had a significant influence in her lifelong affection for dogs. "Ginger was abandoned as a puppy on a cold January day in 2007. I adopted her from the humane society where I'd been volunteering as a trainer and fostering dogs and kittens. Ginger earned her Canine Good Citizen (CGC) award and became a registered therapy dog at about 1 year of age. She made weekly therapy visits to a local nursing home for nearly 4 1/2 years before we relocated back to Missouri. Ginger was a favorite of staff as well as residents at Stonehill Care Center who looked forward to her weekly visits and she will be greatly missed." "Opal was bred to be a service dog but was 'career changed' out of the program due to her gregarious personality and dislike for force-based training. She responded very well to positive reinforcement/clicker training and was certified as a demonstration service dog. She accompanies me not only in talks about service dogs, but due to her agreeable personality, in my work with dogs with fear and aggression issues.Opal has the unique distinction of making history as Iowa's very first Dog Scout!" animal welfare and training dogs to help make them more adoptable. 2012. In this position I performed needs assessments of applicants for service dogs, placed dogs with new clients/handlers, provided in-home training and support, did presentations on service dogs, provided re-training as needed, and tested and certified dog/handler teams." Eau Claire County Humane Association in Eau Claire, Wisconsin. Fortunately, she was one of the lucky ones that was adopted." "In addition to shelter experience, I taught group classes in Wisconsin and Iowa, and did private consulting for behavior issues in Missouri, Wisconsin and Iowa prior to opening Canine Connection in 2009. I have been teaching dog training professionally for 8 years and prior to 2007 part time as a hobby. I've had a lifelong interest in biology and animal behavior. I bought my first animal behavior book in the early 1970's on a day off as a camp counselor in southwestern Virginia, and have been studying psychology, biology and physiology since high school. I have also taught biology and physiology. "My knowledge and method of dog training and techniques has evolved over the years from military style compulsion training with a choke chain and leash corrections (which I never liked and never did as forcefully as instructed) to prong (pinch) collars to various types of balanced and positive reinforcement training, including using a clicker as an event marker but not an end marker, and finally (genuine) clicker training. My knowledge and methods of teaching and training people has also evolved over the past 4 decades since I took my first paying teaching job as a golf instructor and Head of the Golf & Team Sports Department at a private girls camp in Virginia in the early 1970's." "I have been associated with the International Wolf Center in Ely, Minnesota since 2003, participating in seminars, wolf pup care, and a wolf ethology (behavior) course for graduate credit." © Lucinda "Cindy" Ludwig All rights reserved. "Here I am interacting with 10 week-old gray wolf pup, Grizzer during the 2004 pup socialization period at the International Wolf Center (IWC) in Ely, Minnesota. Every 4 years the center adds new pups to its exhibit pack, and Grizzer was one of 3 pups added in 2004. For 10 weeks the pups undergo intensive socialization with carefully selected pup care staff to make them less fearful of humans so that they can be more easily handled by IWC staff and veterinarians. 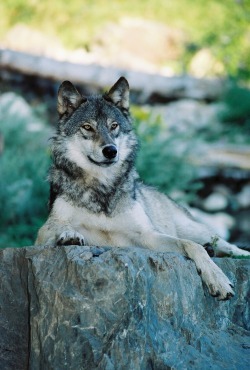 Socialization also causes the wolves to be less elusive than they would be without this intervention. This allows the public to view them through the glass windows when they visit the center. If the wolves were not socialized, they would hide in the the wooded area in the back of their enclosure and the public would not be able to observe them and learn about wolves. It's important to understand that these wolves are never tame, and are still very capable predators. If anything, socialized captive wolves are potentially more dangerous than non-captive, unsocialized wolves because they are not as afraid of humans. Wolves are not socialized the same as pet dogs, and are not handled like dogs. The wolves at the International Wolf Center are not trained, and only limited staff is allowed to have direct contact with them under the careful direction of the wolf curator. At the left is this same wolf, 2 years later." to Nova Scotia. Not all the pups were this accepting of our presence. watching for mother seals, which would aggressively protect their pups."